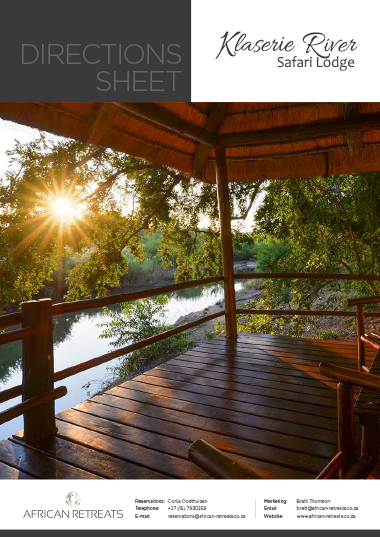 Klaserie River Safari Lodge’s 11 luxury riverfront chalets each sleep two people, while two rooms share an inter-leading door – ideal for families. Every room is located on the Klaserie River and has an uninterrupted view of the water. 11 Thatched chalets are located along the Klaserie River within a stone’s throw of the fish-filled water. 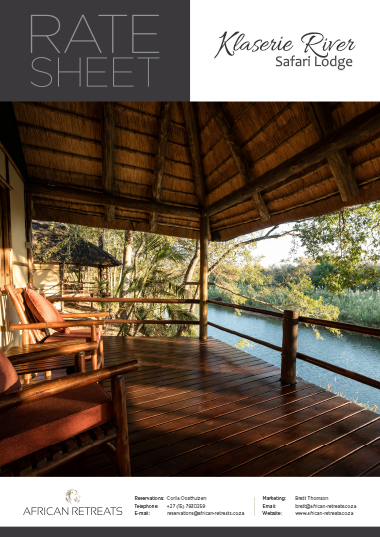 Each room has a shaded wooden deck with chairs and a table from which to enjoy the view and the bird activity in the surrounding riverine trees. A host of water-loving wildlife visits the papyrus-lined channel in front of guest rooms. Two of the chalets share an inter-leading door, which is designed for a family travelling with children. The accommodation is modern and comfortable with big glass windows to enhance the river views, and cool tiled floors throughout the bedroom and bathroom. 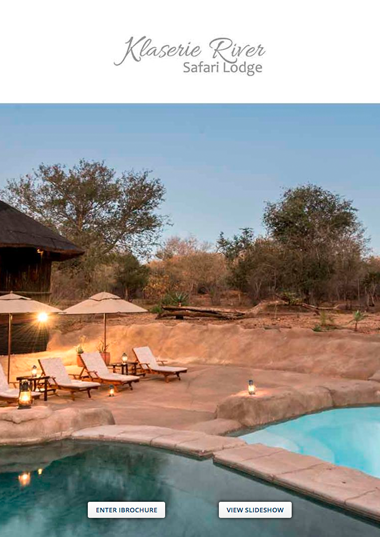 The swimming pools, bar, and boma area are situated close to the rooms allowing for effortless movement throughout the camp. Klaserie River Safari Lodge’s 11 riverfront chalets each sleeping two people, while two rooms are inter-leading – ideal for families. Every room is located on the Klaserie River and has an uninterrupted view through large glass windows, as well as spacious wooden viewing decks. All chalets are air-conditioned, have ceiling fans and elegantly draped mosquito nets. 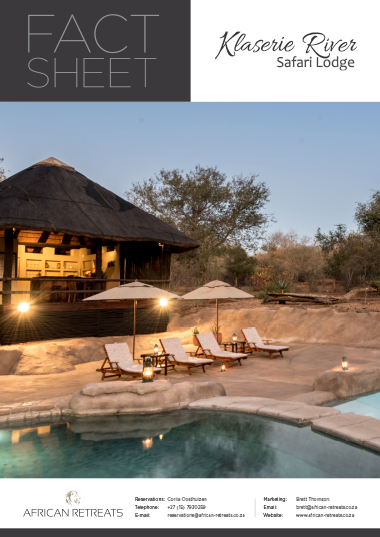 All chalets are thatched with tiled floors and en suite bathrooms (including shower, toilet, and basins). Facilities in each room include a fully stocked mini-bar and a tea/coffee making station, as well as a luggage rack, writing desk, two-way radios and closet space for clothing storage. There is a safe in each room, and every bathroom is equipped with complimentary bath products.